Cut three long pieces of brown yarn. Tape in each corner to hold the hair in place. Add a bow. You can make your own out of yarn or buy some in bulk from walmart. You can even use a fake flower and glue it to a clothespin and then clip the clothspin on. This bow came from walmart and has a grip clip on the back. Tape a fork to the back on each side of the paper lunch bag for the arms. Add her sticker eyes, mouth and eyebrows. Now draw her a shirt and dress and color it in with crayons. You can make small dots with marker all over outfit to make it pretty. You can even add glitter to her skirt if you want. 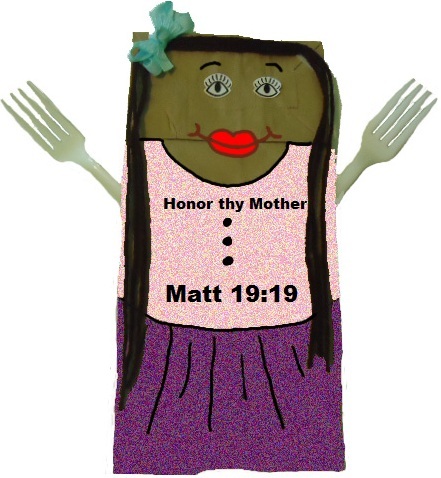 Using a black marker write Honor thy mother and Matt 19:19 on her shirt. Optional: You could cut out a small square piece of paper and write, "Happy Mother's Day" on it and then stick it in between the fork prongs. It will look like she is holding the paper. Now give this to your mommy for Mother's Day!